The Valongo Wharf, located in today’s Barão de Tefé Avenue, covered by the Empress Pier in 1843 and then buried for the construction of the modern port of Rio de Janeiro between 1902 and 1910, remained for all this time underground, hidden from the urban landscape and from the collective memory, even for most of the Afro-Brazilian movement. At a distance of 1.5 km from the Valongo Wharf, the Mauá Pier, built in the 1940s, never really went into operation. This wasteland covering the Guanabara Bay served at best as a parking lot for buses to, in its operators’ words, evacuate tourists from the port. Two places disconnected in history and in space. The first lost the function that it never should have had in the first place. The second never got to fulfil its function. Both have in common forgetfulness and unawareness. According to more conservative studies, at least 500 thousand enslaved Africans disembarked in the Valongo Wharf after crossing the Atlantic in a period of 40 years. Those who did not survive the journey had their bodies thrown in the Cemetery of New Blacks, 1 km away, at Pedro Ernesto Street. The others, once recovered from the crossing, were displayed for sale in the Largo do Depósito (Deposit Square), at Camerino Street, former Valongo Street. This is the area where later on, between 1902 and 1910, the Hanging Garden of Valongo was built with the House of the Guard and the Public Urinal. For years, slaves carrying sacks of salt climbed the rock that then acquired the name of salt stone to cross the Morro da Conceição (Conceição Hill) towards the warehouses at Estreita Street, today Marechal Floriano Avenue. At the base of the Pedra do Sal, the Salt Stone, João da Baiana, Donga, Pixinguinha, among others, invented samba in the turn to the twentieth century. Also in the current Barão de Tefé Avenue is the Doca Pedro II, current address of the hangar of the Ação da Cidadania (Citizenship Action). The most modern construction of the Empire, built by André Rebouças, the first black Brazilian engineer. And at Pedro Ernesto Street, 200 meters from the Cemetery of New Blacks, Dom Peter II ordered the construction of the Colégio José Bonifácio, one of the first public schools of Brazil to serve the population of the region that was mostly of African origin. 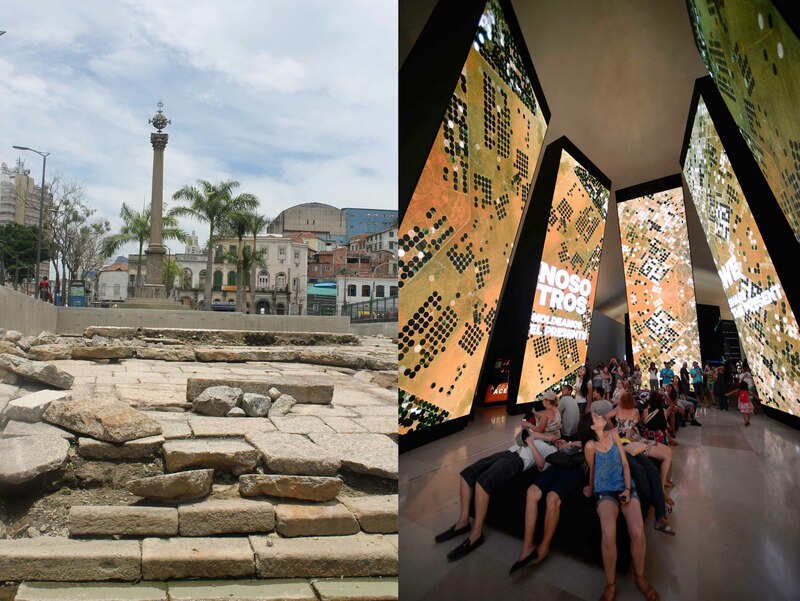 These sites represent an unmatched collection of the African memory and heritage in Brazil. Sites of pain, like the Pier and the Cemetery, and of reconstruction, like the Salt Stone and the Doca Pedro II. After being literally unearthed as a result of Porto Maravilha works, the Valongo Wharf was transformed in a Memorial to African Heritage by decision of the mayor Eduardo Paes. In its inauguration, in July 2012, the Historical and Archaeological Circuit for Celebrating African Heritage was created. Comprised of the Docks, the Cemetery, the Pedra do Sal, the José Bonifácio Cultural Center, the Hanging Garden of Valongo and the Largo do Depósito, the circuit is an initiative of the Instituto Rio Patrimônio da Humanidade (Rio Heritage of Humanity Institute) - IRPH, with the collaboration of the Companhia de Desenvolvimento Urbano da Região do Porto do Rio de Janeiro (Company of Urban Development of the Port Region of Rio de Janeiro) - CDURP, the Municipal Department of Culture (SMS), the Special Coordinator of Policies to Promote Racial Equality (Ceppir), the Municipal Council in Defense of Rights of Blacks (Comdedine), the Institute of National Historic and Artistic Heritage (Iphan), the State Institute of Cultural Heritage (Inepac) and civil society organizations, such as the Institute of Research and Memory of the New Blacks (IPN), scholars, intellectuals and Afro-Brazilian religious leaders. Every year, the Cemetery of New Blacks receives increasingly more visitors. The restored José Bonifácio Cultural Center continues to dedicate itself to Afro-Brazilian culture. The Largo do Depósito, also known as Praça dos Estivadores (Longshoremen’s Square), went through recovery and infrastructure works. In 2014, the surroundings of the Salt Stone, a listed state monument, was acknowledged by a Municipal Law as the Area of Special Cultural Interest of the Quilombo da Pedra do Sal. Built at the site of slave trade, the two edifices of the Hanging Garden of Valongo - the House of the Guard and the Public Urinal - are now occupied by organizations involved with African heritage, the Cultural Organization Remnants of Tia Ciata (ORTC) and the Cultural Center Small Africa (CCPA). In a joint action of municipal, state and federal governments, with the participation of civil society and coordinated by Iphan, the Valongo Pier is a World Heritage candidate, currently under analysis by the United Nations Educational, Scientific and Cultural Organization (Unesco). This will certainly expand the acknowledgement and visibility of the Pier and of the entire circuit. Shedding light on these sites of memory, supporting and valorizing cultural manifestations of African matrix is fundamental for us to face our shames, review our history and, beyond the pains, try to overcome our most profound inequalities for a better tomorrow. Built over the Mauá Pier, the Museum of Tomorrow gives new meaning to this place, turning something empty and functionless into a public space. With free access to the residents of the Port Region and to teachers and students of public schools, and practicing low prices, the cultural equipment is accessible to most of the population. A visit to the surrounding park offers a feeling of looking at the city from the Guanabara Bay. Moreover, it also draws attention to the Bay itself. The content of this architectonic icon intends to be provocative, based on scientific information and interactive technologies, a reflection about social relations, consumption practices and uses of natural resources for the planet’s sustainability. Within and without, the Museum invites us to reinterpret and revise our opinions and positions about the place, the now and the tomorrow. The Mauá Pier, reinvented by the Museum and the Valongo Wharf, in tune with the Circuit of African Heritage, is rediscovered, acknowledged and institutionalized. The Museum and the Valongo Wharf, as different parts of Porto Maravilha, each with its own function, complement each other so we may reflect and construct agendas to overcome our inequalities. Both incite ethical and political reflections about the city and the citizenship we want and deserve.